Lon Clark's rich baritone voice is memorable for his portrayal of Nick Carter, Master Detective on the Mutual Network, 1943-55. 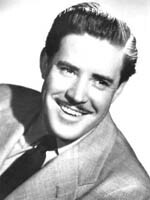 Lon Clark (January 12, 1912 – October 2, 1998) was a New York City actor of stage and radio. He began as a musician and actor in traveling tent shows, followed by a season with the Cincinnati Summer Opera. After participating in radio drama in Cincinnati, he arrived in New York during the 1940s, and his rich baritone voice quickly led to network radio roles. He had the title role in Nick Carter, Master Detective on the Mutual Broadcasting System from 1943 to 1955.Clark also played the district attorney in Front Page Farrell. Clark was also a familiar voice on such programs as the weekday serial Mommie and the Men, the frontier serial adventure Wilderness Road, the World War II dramas Words at War (1943–45) and Soldiers of the Press (1942–45), the quiz show Quick as a Flash, the soap opera Bright Horizon, the science fiction series 2000 Plus and Exploring Tomorrow, Lights Out, The Mysterious Traveler, The Kate Smith Hour, The March of Time, The Adventures of the Thin Man and Norman Corwin Presents. Please help me find the violinist and the name of the composition he/she plays. It is so beautiful, so many thanks if you would be kind enough to help.